Indian Government has set an ambitious target to install 100 GW of solar capacity by 2022, out of which 40 GW has to come from rooftop projects. 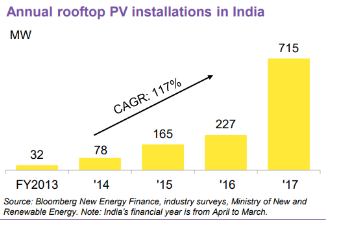 However, the country has managed to set up just over 2 GW of solar rooftop capacity so far, while the target for the financial year 2017-18 was 5 GW, according to the data from MNRE. Experts are raising concerns that Rooftop projects can’t be added in that quantity as a lot of roof structures especially residential are not designed to carry the additional loads of Solar PV Panels. However Small businesses, which contribute about a one third to India’s $2 trillion economy, suffer from high power tariffs and erratic supply causing them to fall back on expensive and polluting diesel generators to keep the lights on. This is where we see a potential for PV rooftop projects. Government establishments and commercial buildings like malls or even warehouses have the capacity to install significant capacities of Solar PV. Once installed on roofs, It will be imperative for all players in the Solar Energy domain to come up with a suitable strategy to optimize power generation as well as tune-in operational efficiency. Maintenance at regular intervals is crucial for extending the life and generation performance of solar plants of any size. 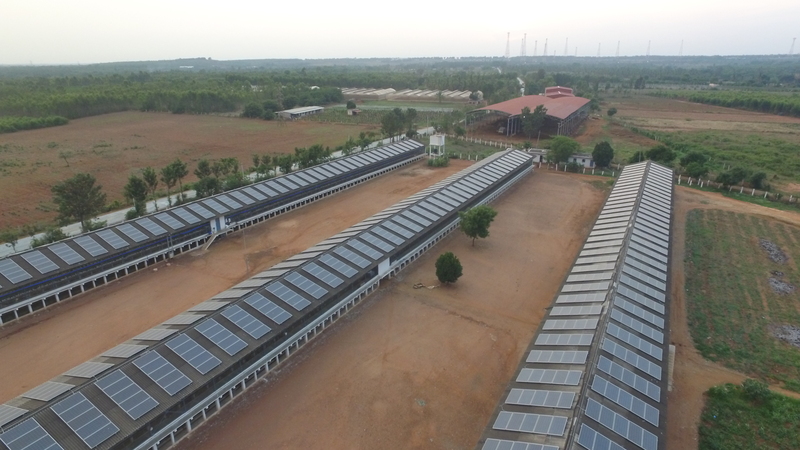 Avi Solar one of the leading O&M Service Provider for utility PV plants is now gearing up to serve the rooftop market in India. Unlike utility plant, it is not viable to have dedicated engineers for rooftops; hence Avi solar has created “O&M Service Hubs” at strategic locations across the country. These hubs will have a workforce and spares that will cater to a bunch of rooftops. Work Permit: Most industrial rooftops have a permit system to work akin to a factory set up and O&M provider has to plan well in advance for any maintenance activity. Planned schedules: Plant maintenance is a repeated activity with standard operating procedures to be followed for Preventive Maintenance (PM) and Corrective/ Break down maintenance (CM). Reporting: Every scale of developer/Investor/Corporate owner of a solar PV Installation is interested in timely reports of Power generation and Health parameters of the Plant. The fairly recent advances in monitoring solutions have not penetrated the rooftop market. Reporting and analytics are not organized as much as Ground mounted plants. Scattered sites: Ground Mounted plants may have a full-fledged SCADA monitoring system whereas many Industrial rooftop plants have to invest in third-party software (portals) to collate data from various sites. Safety: As the Rooftop plants are at elevated places, the safety of workers is of paramount concern. Safe working practices and PPEs are a must in this industry. Based on extensive field operations experience and feedback from customers, Avi Solar O&M team has devised indigenous ways to address the above issues. Micro-level operation management, Spare management, Optimization of resources based on requirements in each city and state is devised. Macro-level planning, safety training, and monitoring ensures the smooth functioning of the business. Avi Solar Energy Private Limited has developed a software tool SPIDAR (Solar Plant Intelligent Data Acquisition and Reporting), a simple application software that connects owner/client of a PV plant with the real-time generation reports and performance data gathered by engineers/technicians at the site.